Data file sharing among Windows, Linux OS, and Macintosh users, with user name, password protection, and managed access in local workgroups. The backup and recovery application provides system backup, remote boot and recovery for Windows clients. Can act as a Dynamic Host Configuration Protocol (DHCP) server. Can act as a DHCP client for easy network configuration. User-friendly Web interface for setting up users and access rights. Built-in FTP server provides convenient high-speed file transfers. MiniStor 700D3 Series is an intelligent network storage solution for small office, medium office, and home network environments, costing less than Windows file servers. 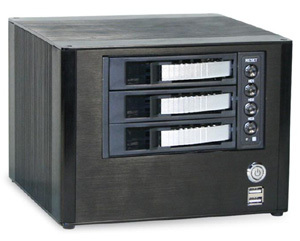 32TB 8 x 4TB 3.5"
Allows users to access shared files for "Read Only" or "Read/Write"